Get the 4x4 Off Roader ready for the big desert race! Check the spare tire and make sure it’s pumped up and then fill the gas can. Use the tools to check out the truck and then strap the driver in. Excitement roars around every corner in LEGO® City! This comes down to 11.34 cent per brick. The 4 x 4 Off Roader (60115) Lego set is no longer directly available from the sites below. However, 3rd party partners of these sites might still have the set available. 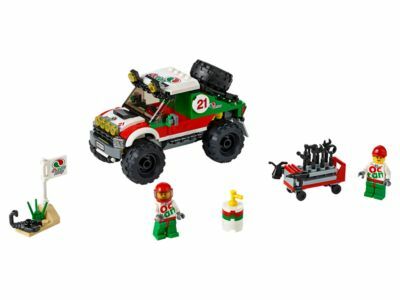 Alternate description Get the 4x4 Off Roader ready for the big desert race, with removable spare tire, tool wagon, gas can and accessories, plus driver and mechanic minifigures.